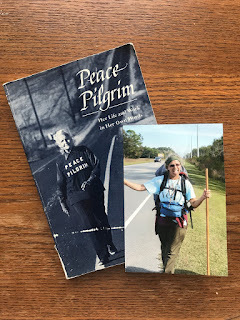 The Curious Bohemian: AM I A 21st CENTURY PEACE PILGRIM? I was sitting on the couch with my feet up enjoying a cup of coffee and right next to my elevated feet was this book inches from them. I immediately took it off the table staring at it in haunting disbelief. I started reading it immediately. Her words and thoughts were like mine. Her desire to own nothing was like me. It has become my secondary Bible ever since. Peace has taught me so much. Her spiritual thoughts and moral compass are ideals that I aspire to have, and in some areas, already live by. The things that aren't exactly the same are only because I haven't grown to her spiritual level but I'm getting there. She walked with nothing; only a pencil and a notepad. She carried no money and would not ask for food or shelter. She loved God, she lived by the word but didn't preach or quote from the Bible. She gave her life to humankind. She became vegan because she loved animals and felt if she couldn't kill the animal herself for food, she wasn't going to eat meat that other people killed. Her book is amazing and I read it biblically. Her message is the same as Jesus's message because she loves the Lord and truly gets him. The day that I found this book on that cocktail table in Elkton, Maryland was the first day that I realized that the Higher Power was winking at me. It was His first 'God wink' to me. When I look at the cover of this book, I almost can see similar facial features in her that I will probably have when I'm her age. I am The Curious Bohemian. I will ask for something to eat if I'm hungry and I will accept funds if someone chooses to support me in this way. My backpacking pilgrimage is not about World Peace but it is about inner peace. I'm not quite vegan but I do believe that someday I will go down that road. I hope I'll change that soon. I, too, don't preach the word of God but I certainly try to live by it and to behave as Jesus-like as possible. I fall short in this area. Her book 'Peace Pilgrim' wasn't even written by her. It was written by a group of people who knew her, who were influenced by her and who loved her. I'm writing my own book and I doubt there will ever be a book written about me and I'm totally cool with that. I don't think she wanted that. I know Jesus didn't want that either. It's about the message, not the wo(man). I'm not a peace pilgrim but I try to be. I don't see myself walking without a backpack anytime soon nor will I not ask for help if I truly need it. I'm not her, I'm me. This book came into my journey very quickly and was perfectly placed. It appeared in my path on day 15. It was like God gave me a spiritual tool specifically designed and relatable to me and He made this tool so blatantly apparent, it would have been impossible for me to ignore it. Peace and I are Spirit Sisters and I feel she is my guide. they cared about the whole and they did it with nothing on their backs and nothing in their pockets. She is my mentor and so is he.